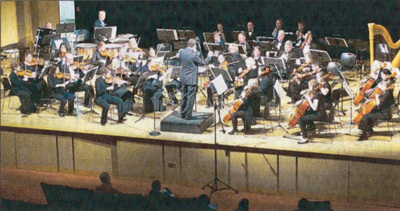 MANCHESTER — Manchester Symphony Orchestra and Chorale’s concert on Friday, March 23, conducted by Carolina Flores and Joseph Hodge, offers an escape from the end of a New England winter to Paris, the City of Lights. The Chorale will be joined by singers from choral groups directed by Carolina Flores at Manchester Community College, including the baritone soloist for the Fauré Requiem, Christopher Daugherty. Paris has always been a beacon for musical talent. In 1787, Mozart traveled there with his mother from their homeland in Austria. Sadly, not only did he fail to find any long-term employment, but his mother fell ill and died. The one great success in his six-month stay in Paris was his Symphony No 31. Mozart knew that the Parisians admired grand gestures, and in the symphony’s first movement, he gave the City of Lights a musical fireworks display, full of repeated ascending scales zooming up through the octaves. In the final movement, he played on the audience’s expectations, beginning quietly. Then, as Mozart wrote to his father in Vienna, “as they heard the forte, they started to clap.” Hodge will conduct Mozart’s “Paris” Symphony. Gabriel Fauré composed his petit Requiem, as he called it, for funeral services at Paris’s Church of the Madeleine. This musical setting of the prayers for the dead emphasizes serenity, especially in the Pie Jesu, a soprano solo, which will be performed by Ava Wing. “The fear of death in Fauré’s Requiem is gone, and death is seen as an aspiration towards happiness and peace,” says Flores. Also on the program is Fauré’s full orchestral version of “Cantique de Jean Racine.” Racine’s poem describes divine grace as the daybreak that awakens the soul from slumber. Faure’s musical setting of this poem is sublime. “Fauré Requiem” will be performed at 7:30 p.m. on Friday, March 23, at the SBM Foundation Auditorium on the campus of Manchester Community College, Great Path, Manchester. Tickets can be purchased at the door. Prices are $18; $15 for seniors; $10 for students, free for those younger than 18.